herbs including marjoram, sage and chamomile. The easy way to treat a horse as nature intended. Your horse will love them! 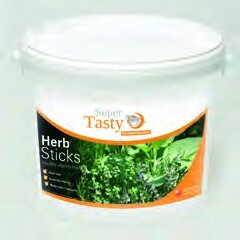 Below are some recent questions we've received regarding Super Tasty Herb Stix, including answers from our team. Do you have nutritional analysis for this treats? Rosemary herb blended with Alfalfa.